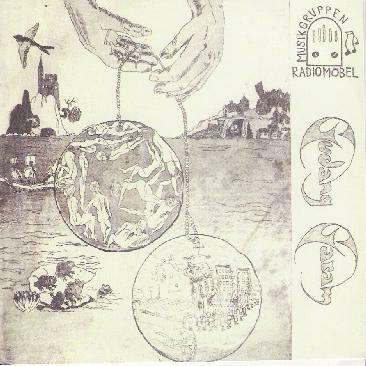 This CD is a reissue of Radiomöbel's 1978 LP of the same title. The feel of the album is in the definite kraut rock mould, and it definitely has all of the elements of the timeless classic, which apparently it is. I do not know, because I am new to their name. More initiated will know the details and will know exactly what to expect from this band. I will therefore try and describe their music for the uninitiated amongst us. Initially, as I listen, the atmosphere stirs me very much in the vein of distant past Pink Floyd/Amon Düül II/King Crimson, and others of the same ilk. It is mostly instrumental, and throughout the CD is well immersed in strange, ambient, and thoughtful passages of music, which all tend to blend seamlessly into one another with all the necessary elements to take you on a momentous journey in sound experimentation. The subtle pads and chord structures overall stir a Pink Floyd shine on the sound in places, Pompeii era, in others. I could also liken aspects to certain Hawkwind, "High Rise" and "Ejection" for example, yet it is more Pink Floyd in the movement, pace, and construction of the tracks than it is Hawkwind. But nonetheless, I can definitely hear Hawkwind and a whole host of modern day bands that seem to echo this style so uncannily. The music itself seems to take influence from the bands of the time, and it expresses those possible influences in a sort of mish/mash of everything that makes an album a classic. It has the Amon Düül II female vocal style track. It has the obscure German narrated/ranted moments. It has Gong spaces. Slight Steve Hillage vibes. Elements of Hawkwind. What else does one require from a CD? It is always good for me to visit places of the past that were non-existent to me. I love all of the bands that I have mentioned, but to me Radiomöbel are an amalgamation of all those bands that I have mentioned, so therefore they could be trying to copy or imitate these musical tastes. I do not know. It sure sounds that way. As for modern day sound-a-likes, Mr Quimby's Beard certainly do resemble them most, in a fashion. I guess that it is the chord pads, structures of the songs, and the feel that gives me this link. Mr Quimby's Beard however has a more present-day feel in sound. They are a lot less raw, and a lot less rough. This however is what makes this band an interesting discovery for me. I love the Amon Düül rawness about it. I love the playing and the tracks themselves, even though there are a few bum notes by the moog lines. But that does not matter because things like this give it an edge and an earthy energy, which comes across fluently throughout the disc. What more can I say? It is a definite journey album. It is something that I will be listening to again and it is a music that sits today, as it did yesterday, quite comfortably. From start to finish it kept me interested, it never got boring, and it was a pleasant surprise for me to review it. For more information you can visit the Radiomöbel web site at: http://www.radiomobel.se.